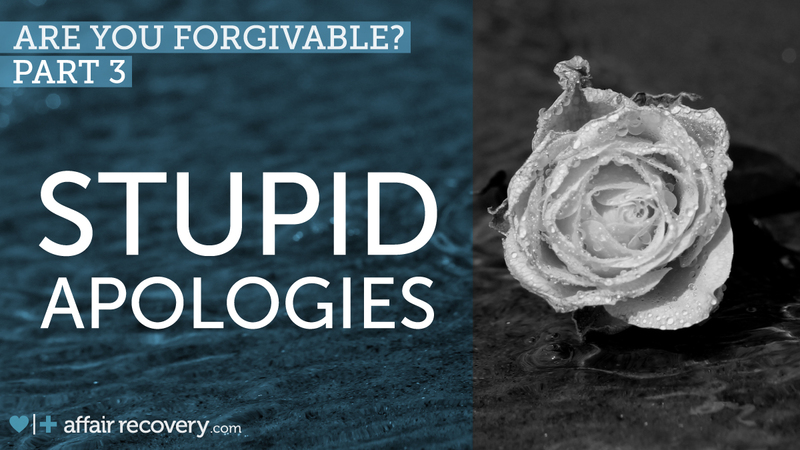 Stupid apologies not only fail to work, they usually make forgiveness even more difficult. As mentioned last week in the article “Are you Forgivable? Part 2”, some of us believe myths about forgiveness. These myths can lead us to use some of the stupid apologies that we list later in this week’s article. I’d like to point out that this series on forgiveness isn’t just intended for couples dealing with infidelity, it is for all of us in committed relationships. In marriage, if we fail to make amends when our mate is hurt, regardless if the act was intentional, we communicate that we don’t care about them or the marriage. We need three things to feel securely attached in marriage. We need to know we matter to our spouse. We need to know our spouse cares about us. We need to know our spouse is committed to us. These three touchstones are foundational to feeling loved by our partner. If our partner does anything that in our mind calls into question any of these three touchstones we will feel unloved and generally react in an attempt to reconnect. Apologies are the key to restoring our attachment and reestablishing our sense of being loved. It doesn’t take much for us to feel the sting from the sense of detachment. It can range from something as subtle as coming home late or not speaking respectfully, to the ultimate betrayal of infidelity. Once we interpret our mate’s actions as dismissive, one of love’s touchstones takes a hit. We’ll begin to feel like “You don’t care. I’m not important to you. You’re not going to be here for me”. Anything short of reaffirming love’s touchstones, through the making of amends and the act of forgiveness, leaves an ever-growing distance between spouses. Once a wound occurs, do you make stupid apologies that make things worse or do you make a heartfelt apology to help restore your relationship? Judge for yourself.. The obsequious apology: “I’m so sorry, I’m so sorry, I’m so sorry. If you use any of the above-mentioned apologies you may have just identified why your mate has had trouble forgiving you. To be forgivable you have to communicate that your mate matters to you, that you care about them (and their pain), and that you’re committed to them. First, it overtly states to the victim that the victimizer would desire to erase the pain if possible. In essence, if the victimizer could live the situation in which the violation was perpetrated again, he or she would rectify the damage. Second, it at least covertly serves as a promise to the victim that the victimizer regrets the past and will try to interact in a loving and trustworthy manner in the future. Therefore, the apology serves both the victim and the victimizer as a method or promise of restitution for the injustices of the past. Hopefully we’ll learn how to do just that. To learn more about how not to apologize, check out one of our Survivor’s blog posts “Another Layer of Forgiveness”. In it, Samuel has some great insight into how to be safe for your spouse within the context of forgiveness. If you and your spouse are struggling more because of mistakes made while fumbling through recovery, you can find hope in knowing that everyone has made mistakes yet healing is still possible. Thousands of people have navigated the critical steps required to walk through their pain and into healing with the 13-week EMS Online course and the EMS Weekend Retreat. Spring, Ph.D, Janis A. (2009-10-13). How Can I Forgive You? : The Courage to Forgive, The Freedom Not To (pp. 155-156). HarperCollins. Kindle Edition. The "The “yes…but,” blame-deflecting apology"
Looking back on confronting her about her 2-year emotional affair, she laid out this excuse about why she did what she did and this same excuse continued to come back over and over and over again during the past 2 years of marital counseling and many, many arguments. Even now, I still feel like we are nothing more than two ships passing in the night without any real emotional, spiritual or physical connection. She makes love to me obligatorily, but in our daily lives, there's no hand-holding, no kissing (ever), rarely a hug and never ever any snuggling. It is a daily bitter pill to swallow wondering if this is what life in this 20-plus year marriage is going to look like. I find myself dreaming about other women, which I know is wrong but when you are asleep your subconscious takes over and you wake up actually wondering if ending what feels like a dead marriage and finding the excitement and commitment of a new relationship with someone else who might actually desire you and respect you and love you and bring out the best in you again. I want that, I long for that, I crave that with every fiber in my body, and if it was with my actual wife, then that would be the most wonderful thing I could imagine. But when she is pretty much resigned to keeping the distance from you and you feel like she really doesn't have your back in life, then it is very tough to keep walking down the same unending path. I have had such a very hard time with forgiveness because I constantly live with this daily pain of disconnect. We haven't been to marital counseling in a couple months -- this coming after going 2 to 4 times a month for a year and a half -- and that is hurting us tremendously. It's not that we don't want to, but we don't have the same corresponding work schedules or the finances anymore. So what to do? I don't know. All I know is I have been praying fervently for so long that I have come to the conclusion that God just doesn't listen to me anymore, especially when He makes if perfectly clear that -- if I do not forgive her -- He will turn me over to the tormenters and refuse to forgive me. So is my lot in life and so is the rift in my relationship with both God and my wife. Man, I'm struggling not to cry as I read this. I hurt for you and know the pain exactly, as I too have an unfaithful wife who has spent 8 months smearing me to our closest friends, her family, and our counselor - blaming me to justify her lies and infidelity. Just in the past 3 weeks has she started to soften, agreeing to do the boot camp here, but she has been hampering my discovery process by withholding information....then when I find out something new, something held back or lied about earlier, it crushes the trust I had been watering and trying to nurture. I’m the wife of an unfaithful spouse who sees me and my actions as the reason he had an affair last year and just last week he met up with her again. I’m devestated and am not sure if reconciliation is possible or safe, but I do know that Jesus came as a redeemer and restorer and yes, I hope that’s true of my marriage for my kids’ sake, but I know he can redeem and restore me, reguardless. I long for it. I Pray for it and I will pray it for you too.